NJ NYC USA Web designers developers E-Commerce Mobile Commerce specialists. Coastal Technologies / WebsFirst, Inc. When you're ready to really make money online, it's time to step up to a premium e-commerce solution. You may already have a shopping cart on your web site, or maybe you know it's time to get one. 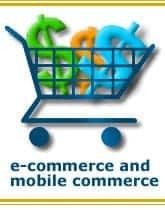 Either way, our cart offers an unbeatable array of features to make your online business a success, without costing a fortune. You may also know someone who hired a fancy graphic designer. They probably designed a beautiful site, but did the end product actually address the business objectives? Did it create additional commerce? Did it make the customers' experience so much more satisfying that they made bigger purchases and shopped more often? We begin by investing a lot of time getting to know you, your business and your customers. We'll ask a lot of questions to understand the marketing you are presently doing, what direction you business is going in, and where you want to take it. We need to understand how committed you are to your customers and what makes your business special. If you don't have an answer for that, we'll help you develop one. It's important. Our goal isn't to build you a "pretty" web site. It's to build you one that attracts new business, encourages customers to buy more and helps you to better fill your customers' needs. A web site must be part of an effective overall marketing strategy. Without that, even the best web site is doomed.